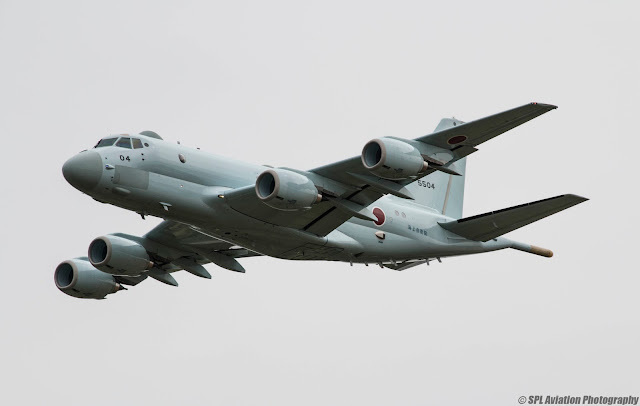 The Kawasaki P-1 maritime patrol aircraft of the Japan Maritime Self Defense Force. From the same folks who brought you the legendary Kawasaki Z-1 in 1972 that revolutionalised the motorcycle industry comes a spanking new submarine hunter? 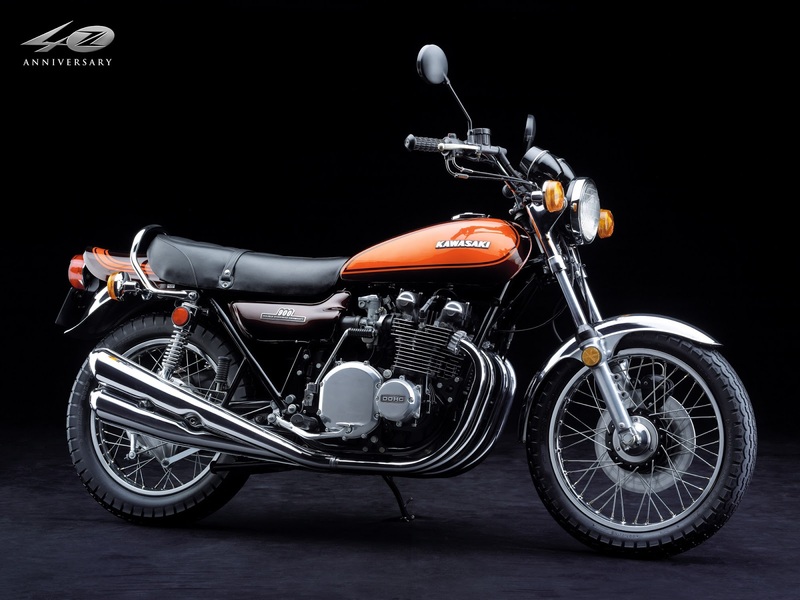 It's not surprising since Japan's Kawasaki Heavy Industries ( KHI ) is a huge industrial conglomerate made up of multiple divisions and disciplines. KHI's product portfolio includes anything from the Soryu class Submarine, bulk carriers, LNG carriers, the T-4 Advanced Jet Trainer, Boeing 787 ( Joint Production ), helicopters, space rockets and space station components, motorcycles and ATV, jet skis, high speed rail, industrial robots .... the list goes on and on. KHI is known as 川崎重工業 or Kawasaki Jukogyo in Japanese. 4 stroke, 4 cylinders, 903cc DOHC super bike. 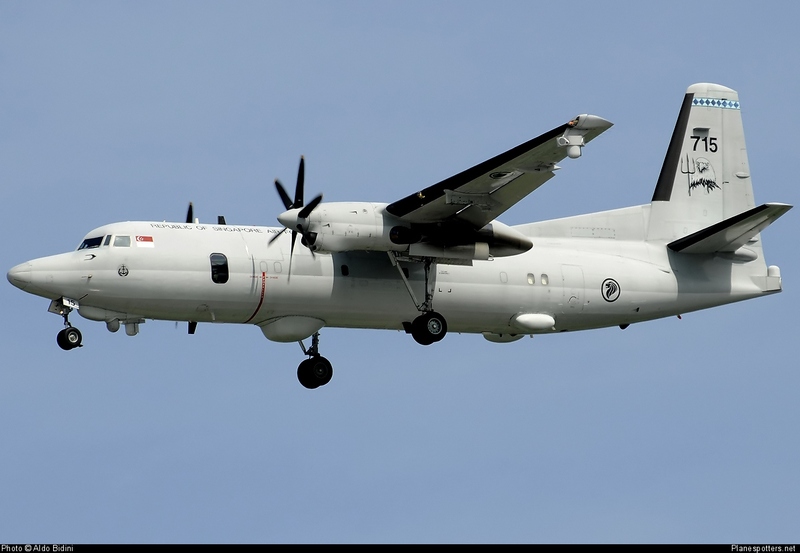 A maritime patrol aircraft ( MPA ) is a fixed-wing surveillance aircraft that is designed to operate over open water for extended duration in sea patrol duties, in particular anti-submarine, anti-ship and search and rescue roles. Its history can be traced as far back as World War I, when bombers and floatplanes were converted into patrol aircrafts to counter the German U-boat menace. These early generation MPAs were frequently armed with machine guns, bombs and depth charges. The requirement for high endurance aircrafts to patrol vast expanses of oceans meant that by WWII, many MPAs were converted from long range bombers ( Consolidated B-24 Liberator ) or airliners ( Focke-Wulf Fw-200 Condor ). Some like the Consolidated PBY Catalina amphibious plane were purpose-built. The emergence of air to surface vessel radars during that era was one of the most significant technological advancement that would change the nature of naval warfare. MPAs armed with high resolution centimetric radars like the ASV III can easily detect small objects like the periscope or snorkel of a submerged submarine making them highly effective in anti-submarine warfare ( ASW ). The immediate post-WWII period ushered in the jet era, and MPAs continued to evolve in operational capabilities with new technologies like sonobuoys and the magnetic anomaly detector ( MAD ), though due to their unique operational requirement of high loiter time at low speed and low altitude, they remained largely piston engine or turboprop driven. The Lockheed P-2V Neptune from which the Japanese variant the P-2J was based on was a typical example from that time. And yes, the P-2J was license-produced by Kawasaki. During the Cold War, the emerging threat of ballistic missile carrying submarines raining death and destruction onto large population centres with their multiple nuclear warheads from thousands of miles away meant that MPAs continue to be relevant and in demand. Many of the MPAs currently in service throughout the world like the Lockheed P-3C Orion, the Tupolev Tu-142 Bear and the Ilyushin Il-38 May are products of that era. It was also during that time jet-powered MPAs began to appear, the first to enter service being the Hawker Siddeley Nimrod MR1. Today, most MPAs continue the tradition of having airframes derived from proven civilian platforms, especially jetliners. The Boeing P-8A Poseidon based on the venerable 737-800 is a typical example. In the future we would undoubtedly have MPAs in the form of unmanned aerial vehicles like the soon to be operational Northrop Grumman MQ-4C Triton developed under the Broad Area Maritime Surveillance programme. When Japan's Maritime Self-Defense Force ( JMSDF ) was formed in 1954, it operated obsolete WWII aircraft donated by the United States which included 17 Lockheed PV-2 Harpoon patrol bombers and 20 Grumman TBF Avenger torpedo bombers. From 1956, 60 Lockheed P-2V7 Neptune MPA were added to the fleet, and starting from 1957, 60 Grumman S-2F Tracker ASW aircraft. 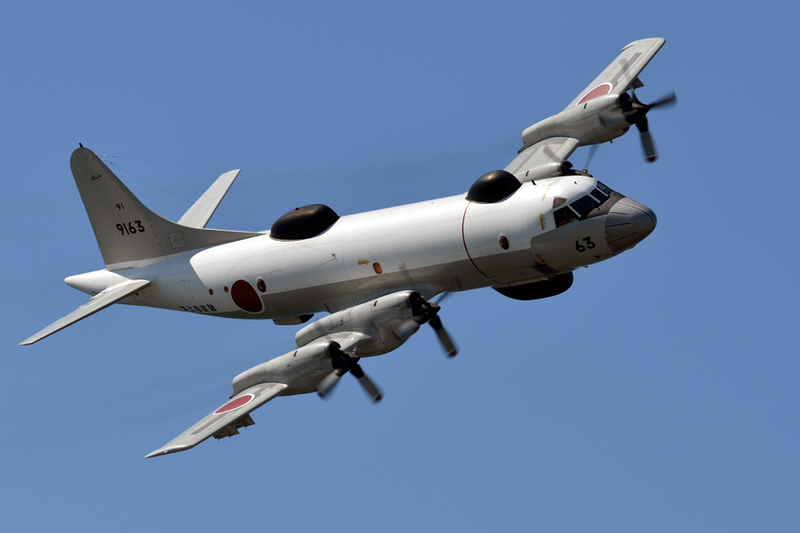 The Japanese loved the P-2V7 so much that when the time came to have them replaced by the more advanced but expensive Lockheed P-3A Orion, they opted instead to develop an improved version, the P-2V7 Kai ( 改 - kai in Japanese means upgrade or to improve ), later licence produced and designated P-2J. A total of 83 P-2J were produced and they were operational between 1971 to 1994.
flies overland with Mount Fuji in the background. for the ships of the JMSDF. Its mission is similar to the EP-3J of the USN. This particular aircraft with serial number 9163 is the last P-3 ever produced. 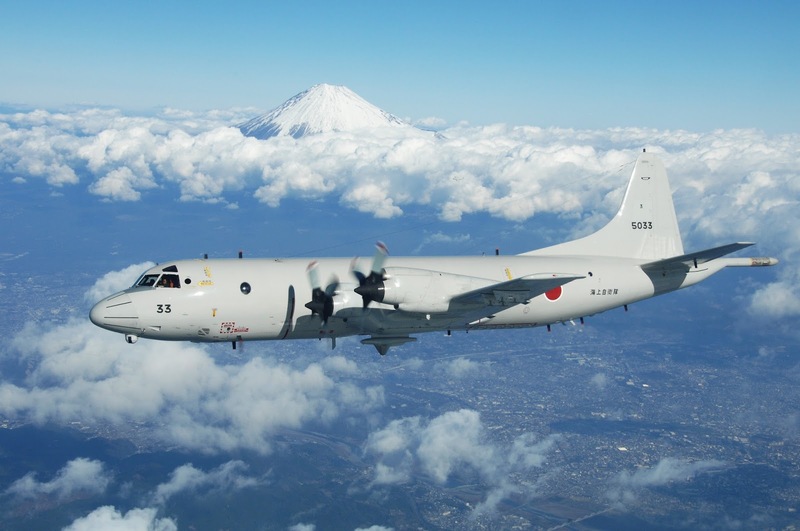 Shortly after the last P-3C ( actually a UP-3D variant, see photo above ) was delivered to the JMSDF by KHI on 1st Feb 2000, marking the end of a production run that lasted for 38 years, the Japanese were already planning for its successor. The Cold War had ended and in the United States, Lockheed's next generation MPA programme, the P-7 Long Range Air ASW Capable Aircraft ( LRAACA ), failed to materialise due to budgetary problems and after incurring huge cost overruns. Existing European alternatives like the United Kingdom's Nimrod MR2 did not meet Japanese requirements. Eventually the Japanese decided that they would have to develop their own MPA. 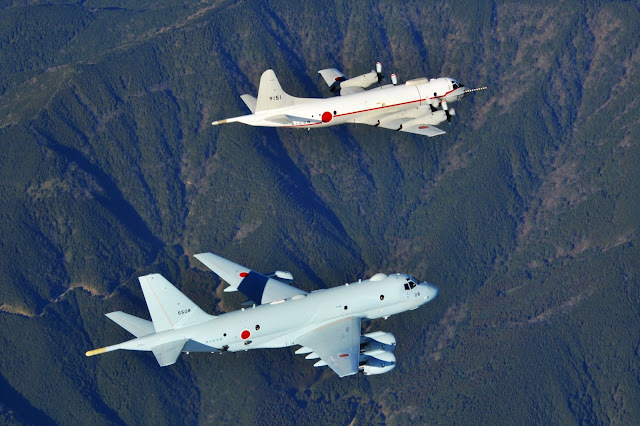 The P-X future MPA programme was thus initiated in 2001 by the Japanese Ministry of Defence concurrently with the next generation transport aircraft C-X programme to replace the C-130 Hercules and the C-1. These two developments were to be managed as a single project and Kawasaki was appointed the main contractor. The P-X and C-X shared structural components and sub-systems and utilized commercial off the shelf products to save on development and production costs. First flight for the P-X prototype, by then re-designated the XP-1, took place on 28th Sep 2007. By March 2010 four XP-1 had been delivered to the MOD for testing and trials. 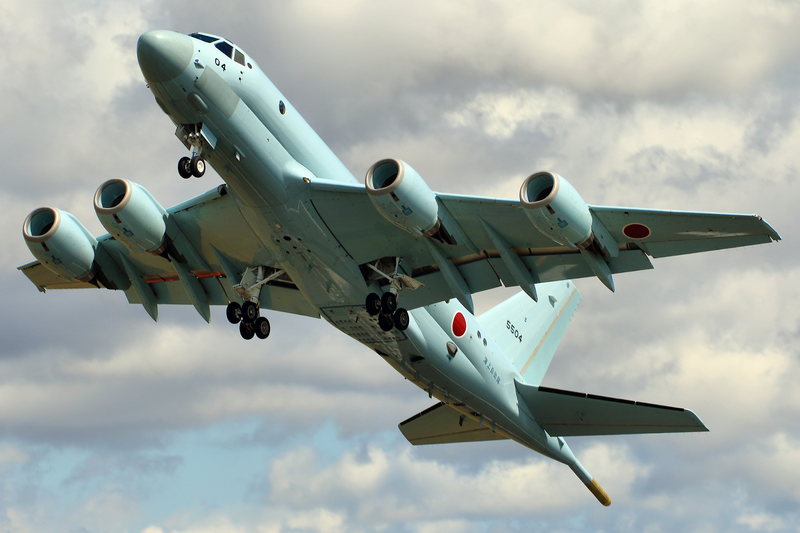 They were introduced into service in 2013 as the Kawasaki P-1 to gradually replace JMSDF's ageing P-3C Orion. They were supposed to have attained full operational capability by Sep 2015. 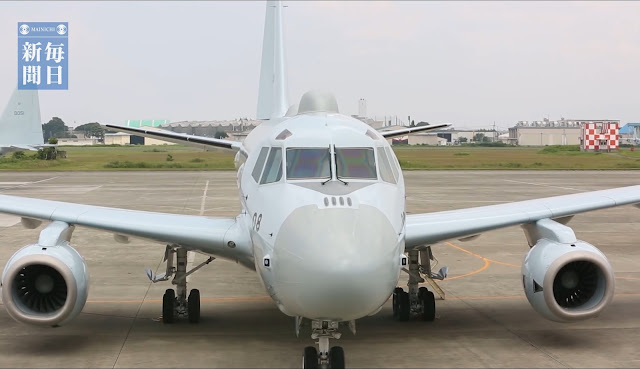 The P-1 is unique among all the various modern maritime patrol aircraft as it one of a few that is completely designed from the ground up and not adapted from some bomber or commercial airliner. That means every single part is purpose designed and purpose built. Also, it was originally created for just one customer, the JMSDF, since the post-war Constitution of Japan forbade the export of weapons and weapon systems until very recently. 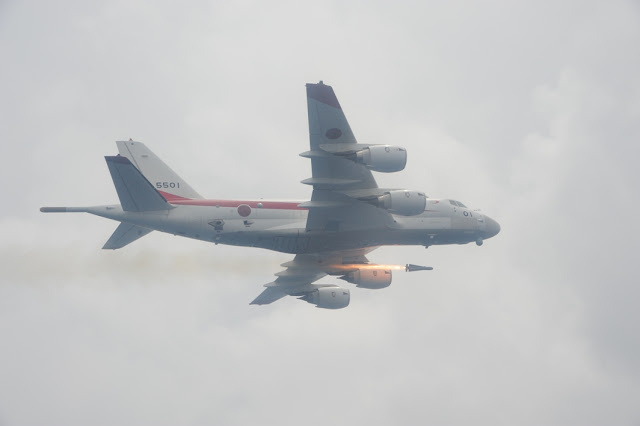 As such, throughout its development and even as it is being deployed in active service, very few outside the defense circles have heard about this mysterious Japanese multi-mission maritime aircraft. 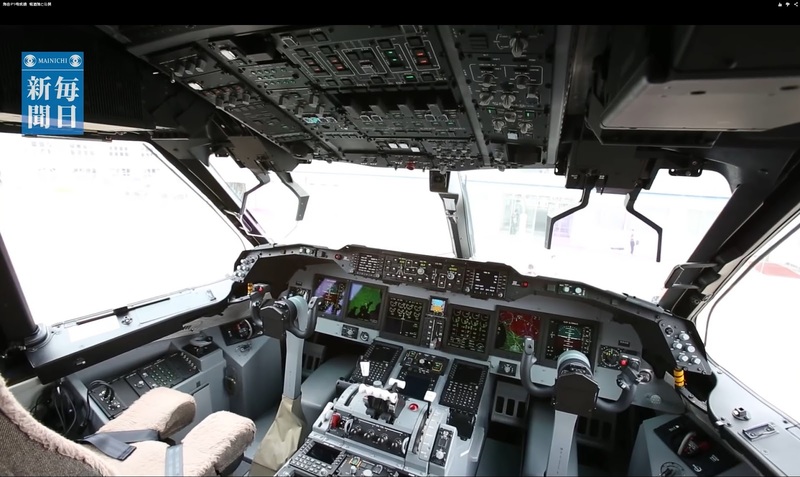 The P-1 has the appearance and size of a 90 - 100 seat regional jet. It has a length of 38m, height of 12m and a wingspan of 35.4m making it significantly bigger than the P-3C and only marginally smaller than the P-8A which it is frequently compared with. The full complement comprises of 2 flight crew and 11 mission crew. 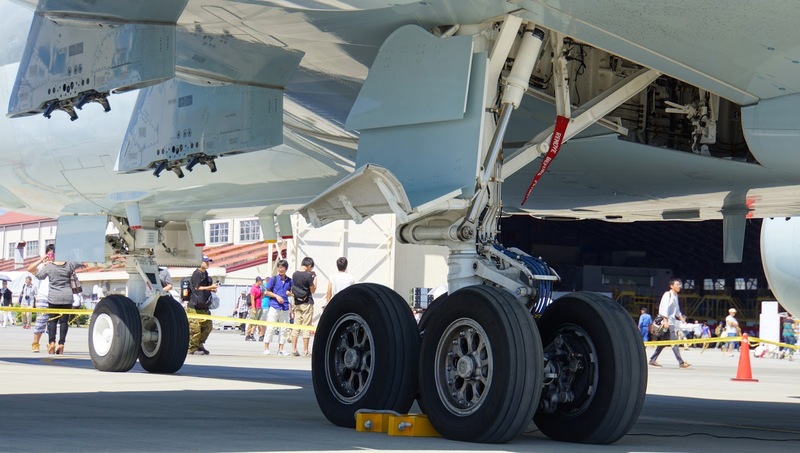 Its maximum take-off weight is 79700kg or 176000lbs. Maximum speed is said to be 996km/h ( 538 knots ) while the cruising speed is 833 km/h ( 450 knots ). The P-1's maximum range is 8000km ( 4320 nm ) and the maximum operational ceiling is 13520m ( 44200 ft ). The P-1 has an aerodynamic profile most suited for low speed and low altitude flight. It has a relatively long wing span with the leading edge swept back at 25 degrees but an almost straight trailing edge. A large wing area of 170m² generates more lift, decreases stall speed and increases agility. Part of the fuselage is made of light weight composite material like carbon fiber. KHI is responsible for fabricating the horizontal stabilisers, Fuji Heavy Industries the main wings and the vertical stabilisers, Mitsubishi Heavy Industries the mid and rear portions of the fuselage and Sumitomo Precision Products the landing gears. 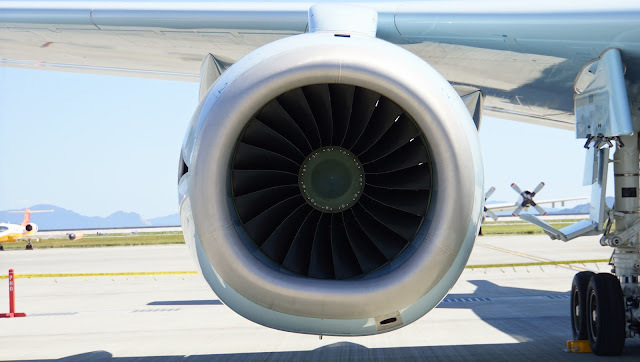 Unlike its turboprop powered predecessor, the P-1 is powered by four IHI F7-10 high bypass turbofan engines. Japan's IHI Corporation developed the F-7-10 specifically for the P-1, using metal alloys that are corrosion resistant in salt environments. Sound absorbing panels are also used to lower the acoustic signature of the engines, achieving a sound level 5 to 10 dB below the P-3C's Allison T-56-A-14 turboprops. The F7-10 turbofan has a bypass ratio of 8.2:1 and each delivers a maximum thrust of 60kN or 13500lbs. 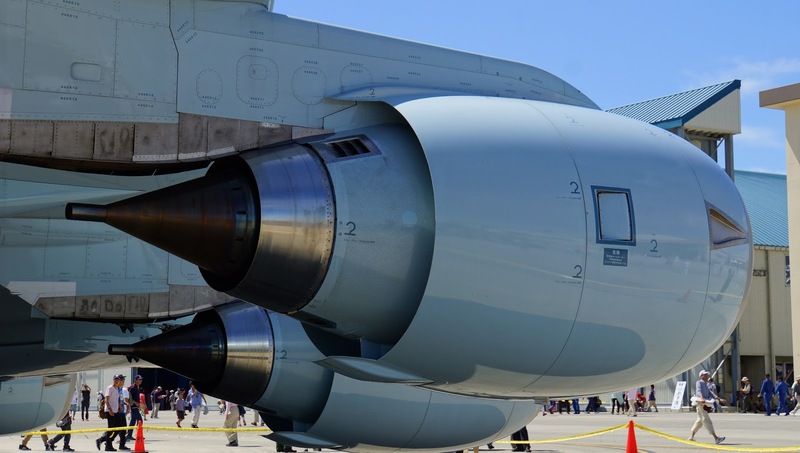 The jet engines enables the P-1 to achieve a greater maximum speed, a higher operating ceiling, a longer range and carry a heavier load compared with the P-3C. Having four engines instead of two is advantageous for MPAs as they frequently fly over open bodies of water at remote locations where airfields may not be readily available for emergency landings in case of engine failure. In addition, MPAs often have to execute their combat missions at low altitudes where bird strikes can be common. A single engine failure in a twin engine MPA like the P-8A would probably have necessitated a turn around whereas an MPA with four engines could still continue its mission with one engine shutdown. If fact, P-3C jockeys are known to deliberately shut down one or two of the Orion's four turboprop engines when on-station to reduce fuel consumption and increase on-station time. The P-1 with four turbofans could supposedly do the same but it would be suicidal to try that on a P-8A. In addition, the P-1 has a Honeywell 131-9 Auxiliary Power Unit ( APU ) installed in the fuselage forward of the horizontal stabilizer to avoid interference with the MAD apparatus in the rear. Unlike the mostly analogue instruments of the P-3C, the P-1 has, in common with the Kawasaki C-2 transport, a modern digital " glass cockpit " with 6 large LCD multifunction displays and 2 sets of Head-Up Displays ( HUD ). The cockpit also features huge glass windows reflecting the Japanese emphasis on low altitude visual searches. You have heard of fly-by-wire where flight control of an inherently aerodynamically unstable design is achieved by onboard computers continuously micro-adjusting the control surfaces. 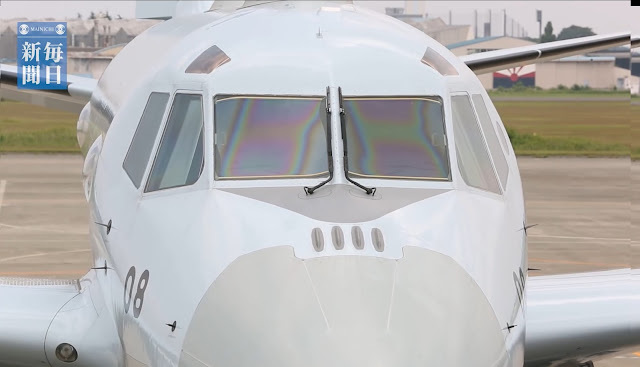 The P-1 is a generation ahead, being the first production aircraft to feature " fly-by-light " ( FBL ) where flight control commands are transmitted via optical fibre to the actuators. This decreases the risk of electromagnetic interference with the multitude of electronic sensors onboard. FBL also has the advantage of reducing the weight of the installed wiring and reduce power consumption. The technology had been extensively tested on the UP-3C before being implemented on the P-1. 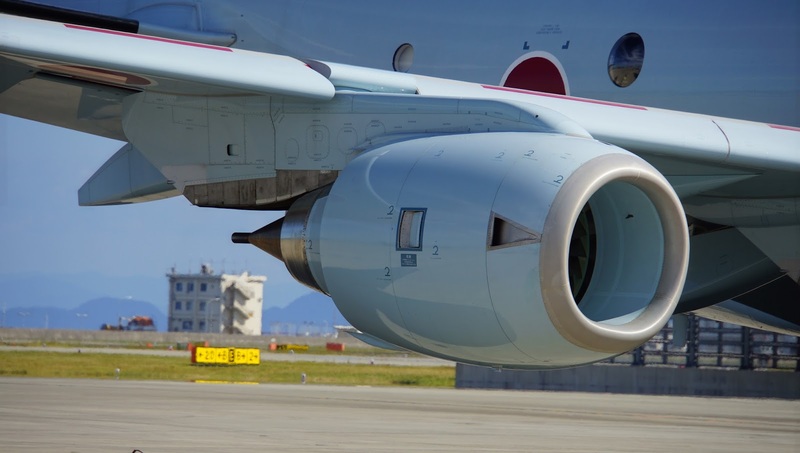 The P-1 is equipped with the HPS-106 X-Band Active Electronically Scanned Array ( AESA ) radar system jointly developed by Toshiba and the Technical Research and Development Institute ( TRDI ) of the Japanese Defence Ministry. 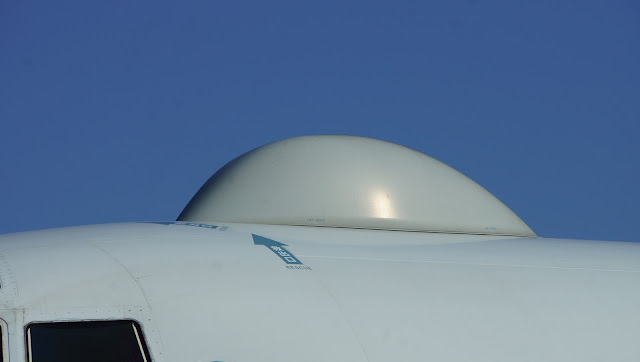 Consisting of 4 arrays, one mounted in the nose, two side-looking panels below the cockpit area and another in the tail, the HPS-106 has a constant 360 degree coverage. It can be used in multiple modes including surface search, air search, navigational and meteorological, synthetic aperture and inverse synthetic aperture. An inverse synthetic aperture radar ( ISAR ) utilizes the motion of the target to create a high resolution 2D image that can allow for threat identification. The P-1 features the Fujitsu HAQ-2 EO/IR suite mounted on a ball-like turret aft of the nose cone for tracking and examining surface targets. It consists of a Forward Looking Infrared ( FLIR ) device for thermal imaging, night vision and navigation, as well as cameras for capturing images in the visible light and near-infrared spectrum. 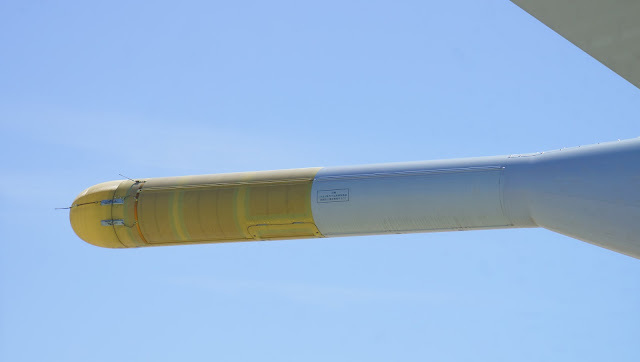 The HSQ-102 magnetic anomaly detector housed in the sting-like MAD boom at the rear of the P-1 is a licence produced version of the Canadian CAE AN/ASQ-508(v) by Mitsubishi Electric. CAE is the world leader in the design, manufacture and integration of MAD systems. They have been designing MAD systems for more than 40 years and had delivered more than 2000 MAD systems to the military worldwide. 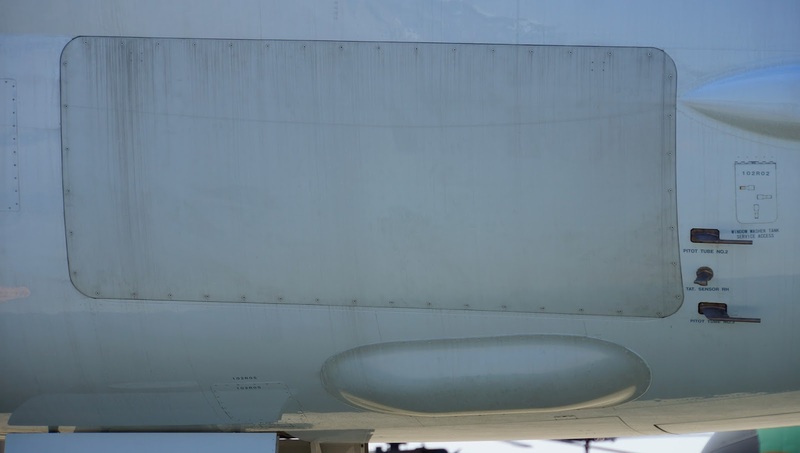 The AN/ASQ-508(v) is also known as the Advanced Integrated MAD System ( AIMS ) and consists of a highly sensitive magnetometer with associated electronics mounted in the tail area of an aircraft to minimize magnetic interference. It detects the variations in the earth's magnetic field caused by the presence of metallic objects in the vicinity like a submerged submarine. The detection range is in the region of 1200m, meaning the MAD will work best with the aircraft flying at low altitudes and at low speeds, both of which the P-1 excels in. One of the key differences between the P-1 and the P-8 is that the P-8 does not have a MAD system. from the aircraft as possible to minimize self interference. 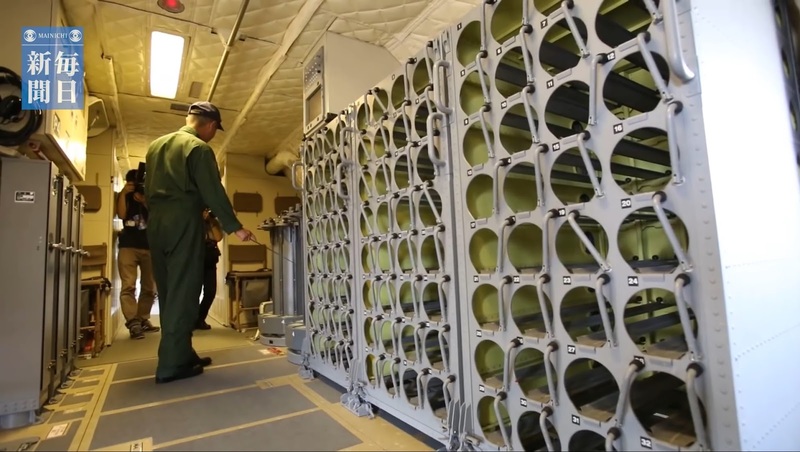 The P-1 can carry 30 pre-loaded sonobuoys and another 60 in racks in the cabin for reloading. The Acoustic Processor HQA-7 is manufactured by NEC. 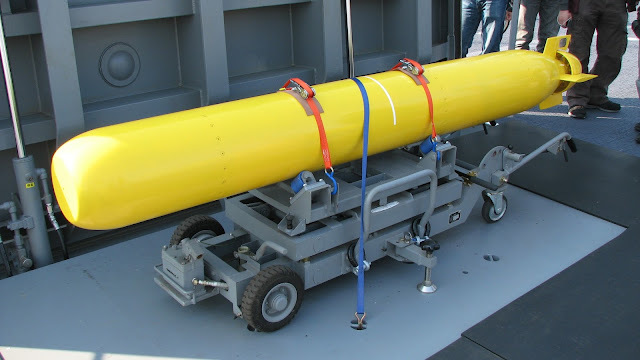 Other components of the acoustic system includes the HRQ-1 Sonobuoy Receiver, HQH-106 Acoustic Data Recorder and the HAS-107 Sonobuoy Controller. Sonobuoy launcher can be seen in the under-fuselage in this photo of the P-1 at RIAT 2015. The P-1 has a Combat Command System designated the HYQ-3 by Toshiba which is basically an onboard combat information processor, some sort of artificial intelligence that can assist the mission commander in planning for the best respond to an encountered threat, like delivering the optimal firing solution on an enemy submarine based on the combined information collected by all the plane's sensors and sensors from other friendly platforms nearby. 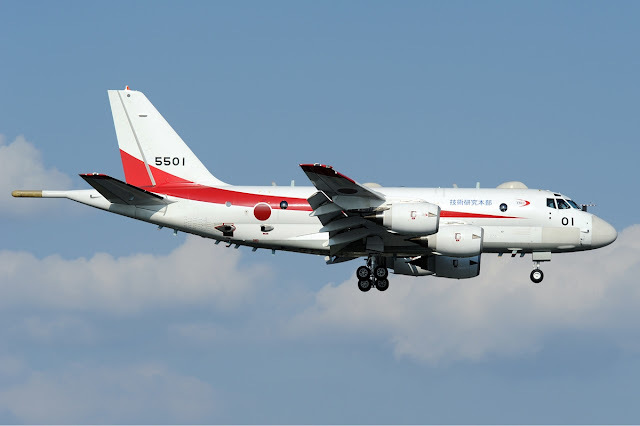 The P-1 is fitted with the HRC-124 UHF/VHF Radio and the HRC-123 satellite communications equipment made by Mitsubishi Electric. 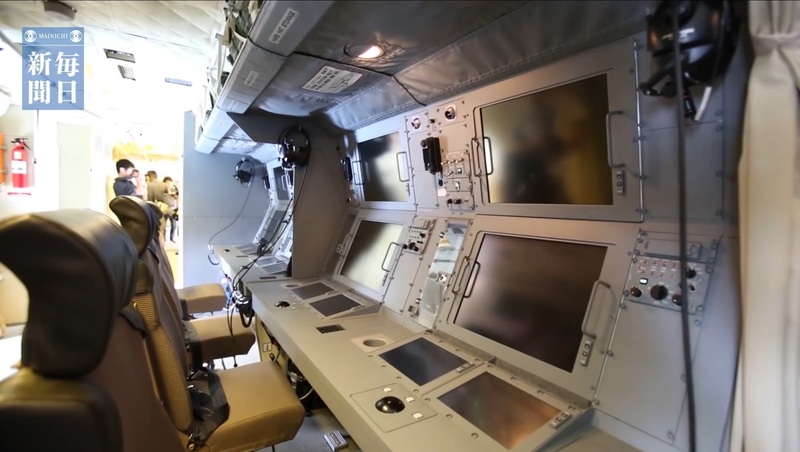 Equipped with Link 16 compatible MIDS-LVT terminal, the P-1 can share targeting and any other information with similarly equipped aircrafts like the F-15J, P-3C, E-767 AWACS, E-2C AEW, MH-60 naval helicopters, F-35 JSF, and surface vessels like the JMSDF's Aegis destroyers. The HPX-105 Identification Friend or Foe system is installed with the two sets of four N-AT-347 IFF antennae mounted in front of the cockpit wind screen and at the under-fuselage area. The P-1 has a total of 8 hard points under its wings which can be used to carry air to surface missiles like the AGM-84 Harpoon, the AGM-65 Maverick and the indigenously developed ASM-1C. 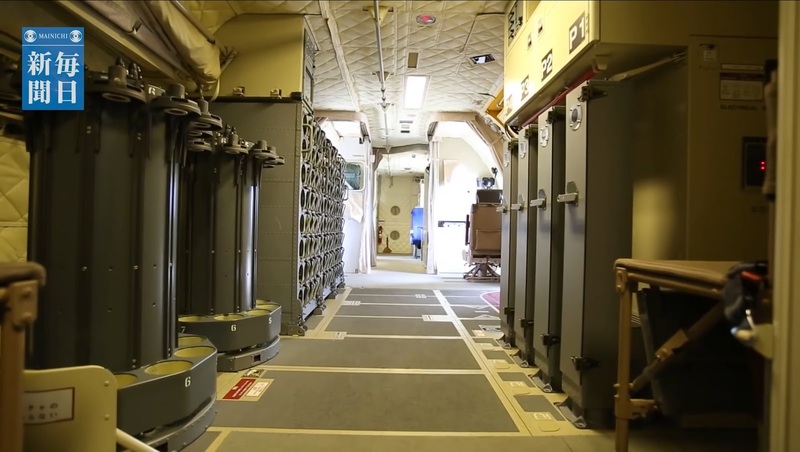 These pylons, also known as the BRU-47/A Bomb Release Unit are rated to carry up to 2000lbs of ordnance each. It also has an internal bomb bay with an additional 8 hard points which can be loaded with bombs, mines, depth charges and light weight torpedoes including the Mk46, the Japanese Type 97 ( G-RX4 ) and the latest Type 12 ( G-RX5 ). Up to 9000kg or 20000lbs of ordnance could be carried. ( with 3 red-tipped N-AS-331 and 1 yellow-tipped N-AS-330 antennae for the HRQ-1 sonobuoy receiver ). 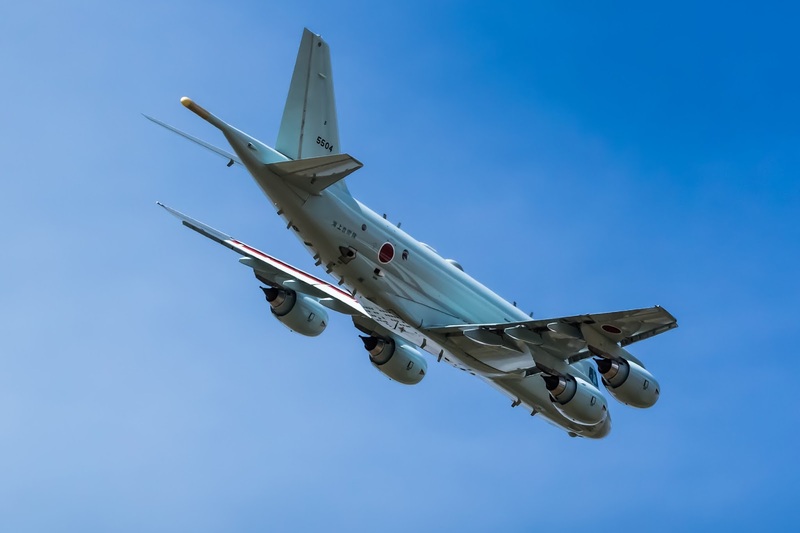 The P-1 is equipped with the Mitsubishi Electric HLQ-9 self-protection suite which includes the missile approach warning system ( MAWS ) and the radar warning receiver ( RWR ), accompanied by the usual dispensers for flare and chaff. P-1 dispensing flares against heat seeking missiles 18th Oct 2015. Japanese MOD photo. An Electronic Support Measures ( ESM ) suite, the Mitsubishi Electric HLR-109B is installed. You can see the ESM flaring which is the prominent bulge on top of the fuselage slightly behind the cockpit. The ESM suite detects and classifies enemy radar emissions and gives the P-1 a secondary role as an Intelligence, Surveillance and Reconnaissance ( ISR ) platform. 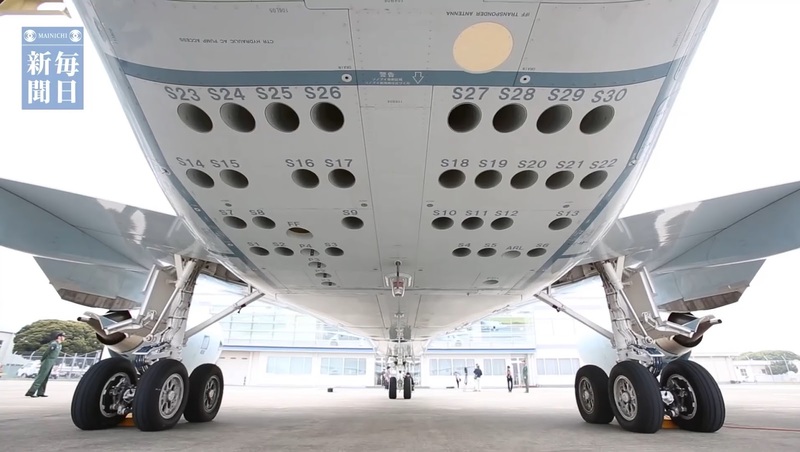 All indications seem to point towards the fact that unlike the Boeing P-8A or the Kawasaki C-2 with which it shares some common components, the P-1 does not have a probe or receptacle for accepting fuel transfers midair. It is highly unlikely that the meticulous Japanese designers would have overlooked this feature. Most probably it was intentionally omitted as a cost saving move. Further more, with a range of 8000km, perhaps the JMSDF chose to live without air-to-air refueling. UP-1 : Utility / multi-purpose aircraft that can be used as a test bed for systems and equipment or in a supportive role as a training platform. EP-1 : Signals Intelligence ( SIGINT ), Electronic Intelligence ( ELINT ) platform. OP-1 : Observation / Visual Imaging platform. AEW : To replace the ageing E-2C Hawkeye airborne early warning aircraft. But the US had just approved the sale of four E-2D to Japan last year, so AEW conversion is currently less urgent or likely. AIRBOSS : As an Advanced InfraRed Ballistic Missile Observation Sensor System platform. Obviously with Dear Leader as one's neighbour, the capability to detect ICBM / IRBM / SLBM launches in a timely manner can be a matter of utmost importance. In Jun 2015, the first XP-1 prototype number 5501 had been converted to the UP-1 configuration with the aircraft number correspondingly reassigned 9501. Based on Japanese Defence Ministry annual budget reports of the past few years, these are the current number of P-1 ordered and on order. Total P-1 ordered so far is 33 aircrafts, excluding the four XP-1 prototypes. The first 13 units from FY2008 to FY2014 are probably the low rate initial production ( LRIP ) tranches. Mass production really starts with FY2015's 20 unit order. All operational P-1s are deployed at Atsugi Air Base in Kanagawa Prefecture. Japanese weapon systems have traditionally been expensive due to the fact that they cannot be exported and so production runs are relatively small and cater to only the local defense agencies. Economy of scale can hardly be achieved with a such a small captive market. That has changed since last year when Prime Minister Abe tweaked the Constitution, paving the way for future weapon exports. And Kawasaki has been hard at work trying to sell the P-1 overseas. Among the potential clients was the United Kingdom, a maritime nation whom in 2010 foolishly retired its Nimrod MR2 MPAs and then abruptly cancelled its replacement, the MRA.4 who's development was by then almost near completion, leaving them with absolutely no MPAs. In July 2015, the P-1 made its first overseas public appearance at the Royal International Air Tattoo ( RIAT ) at RAF Fairford, Gloucestershire, England, in an attempt to generate British interest in the aircraft. If successful, the deal could advance defence co-operation between the two countries and could be worth up to one billion dollars. Two aircrafts flew over to Fairford, number 5504 and 5507, one for static display and one for flight demonstration. You can watch and hear the flight demo here. After the airshow the P-1 went on to Djibouti to carry out hot weather tests before returning to Atsugi Air Base. The P-1's appearance at RIAT was well received and brought the exposure and generated the awareness it needed to compete successfully on the international stage. Hopefully we can begin to see the P-1 at more international airshows in the near future. 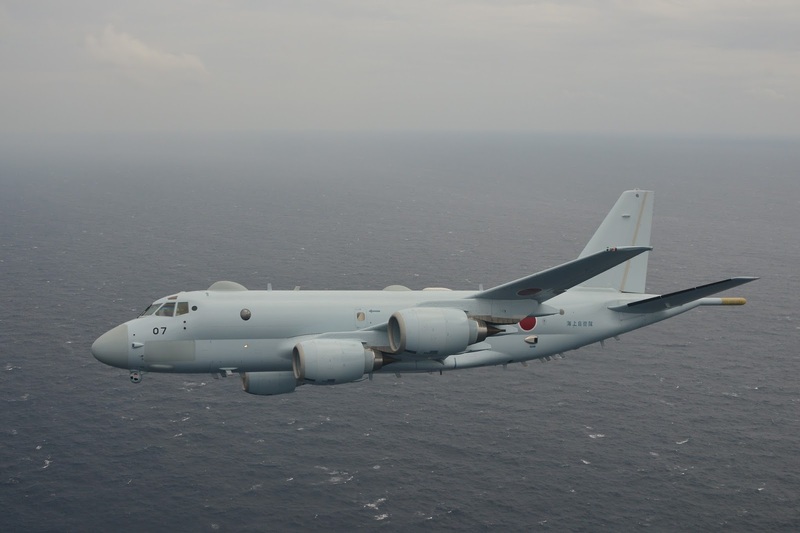 Unfortunately for the Japanese, on 23rd Nov 2015 the UK announced their intention to buy nine P-8A Poseidon as part of the Strategic Defence and Security Review 2015, without going through any tender or competition. However, apart from the UK, there are many other navies worldwide that operate the ageing P-3C Orion and they would soon need a replacement. So Kawasaki should in theory have no shortage of potential clients. The main competition would be the Boeing P-8A as they both have very similar capabilities, not surprising as they were intended to be replacements for the same aircraft. 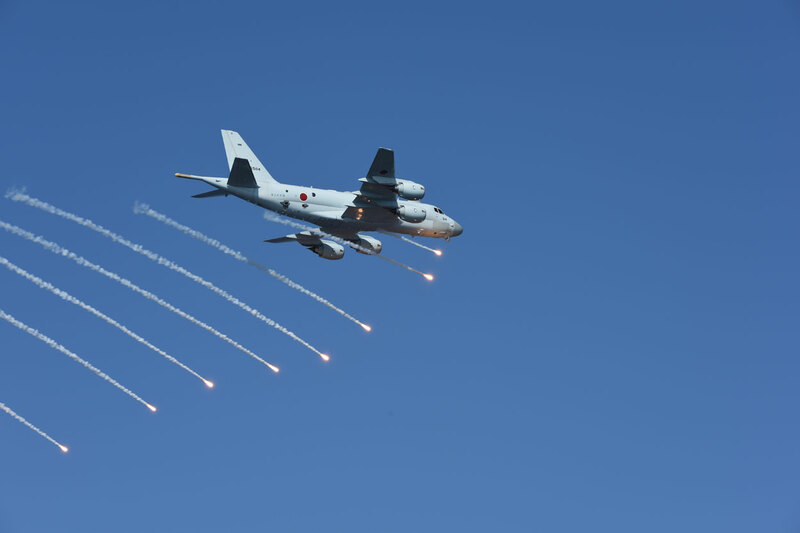 Already, Australia, a major P-3C ( AP-3C ) operator has selected the P-8A as its next generation MPA at a cost of A$4 billion for a total of 8 planes with support facilities. So has India, which will operate the P-8I. 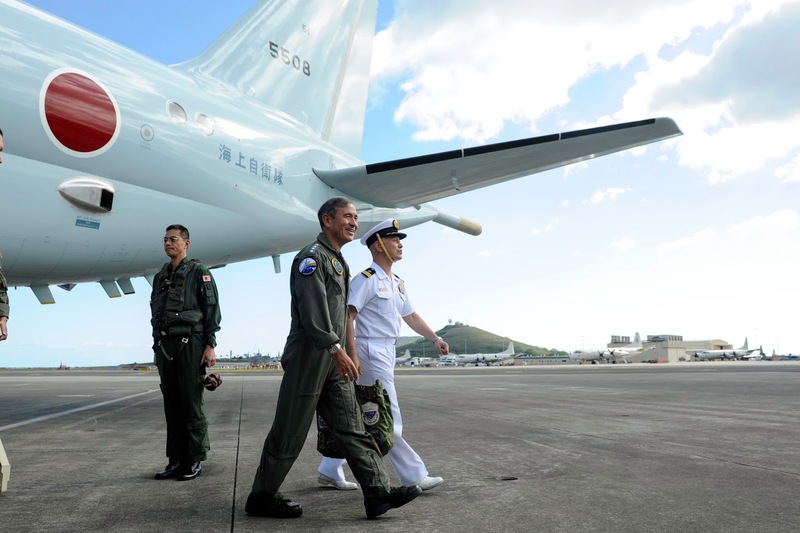 Still, at an estimated US$250 million per plane, the P-8A is significantly more expensive than the P-1 which costs half as much at $150 million ( based on Japanese MOD figures, FY 2015 acquisition of 20 P-1 at ¥350.4billion ). This would make the P-1 a value buy for current P-3C operators as well as any MPA operator looking to renew their fleet. Why not? The Republic of Singapore Air Force ( RSAF ) currently operates a fleet of 5 Fokker F-50 Enforcer II MPAs. These aircrafts have been in service since 1994 and are close to their end-of-life. Upgrading these MPAs would be challenging as the maker, Dutch aviation company Fokker had gone into receivership in 1996 and is now defunct. RSAF had apparently requested to inspect ex-USN P-3Cs in storage in Dec 2010 which meant it was considering the refurbished Orion as replacement for the F-50. Now, five years on, the P-1 has completed its development and has emerged a viable option since it is technically more advanced than the venerable P-3C and is a whole lot cheaper than the P-8A whose capability it mostly matches. 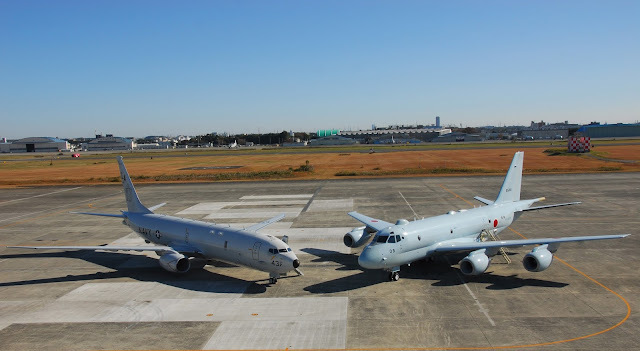 How much cheaper is it to restore a mothballed P-3C to active duty with modernized avionics and 15000 hours of life extension compared to buying a new build P-1 is anybody's guess, but I'll pick the a P-1 over the P-3 anytime. For the past 70 years, the Japanese defence industry had lead a frustrating existence where restricted by the Constitution, their quality products were procured in anaemic quantities only for the domestic market. This dated, self-imposed restriction had finally been lifted paving the way for major arms export. Already, we are seeing Japanese defence companies participating in international trade shows for the first time. The Kawasaki P-1 is a highly capable maritime patrol aircraft and a worthy successor to the P-3C. Its success in Japan had probably been guaranteed even before the maiden flight of the first prototype. Currently the planned procurement is for 70 aircrafts to replace 107 P-3C of all variants. Funding for the first 33 P-1 had already been disbursed / approved. The next logical milestone would be to secure export customers so that production volume can be ramped up further and unit cost can come down. 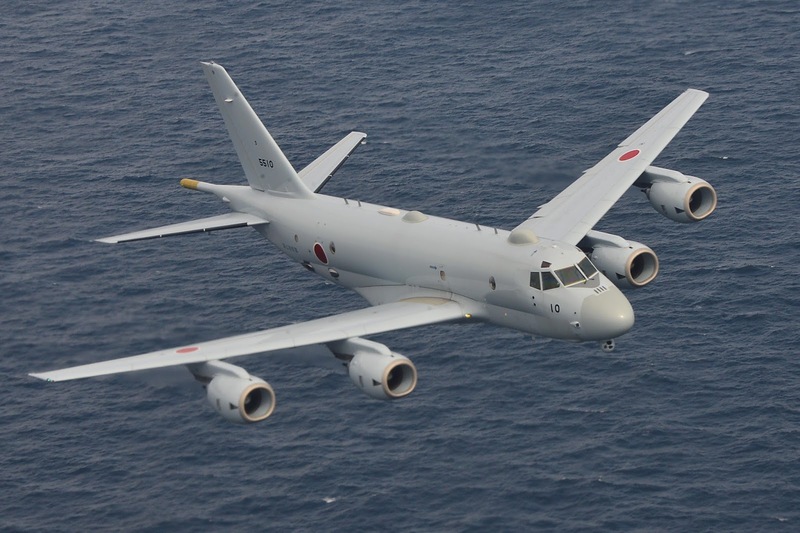 Together with the AIP capable Soryu class submarine, and the ShinMaywa US-2 amphibious search and rescue plane, the P-1 maritime patrol aircraft would spearhead the Japanese effort to break into the international arms market. There would hopefully be some successes soon. Attractive as the P1 is on paper, it would be a political feat to purchase anything from Japan. 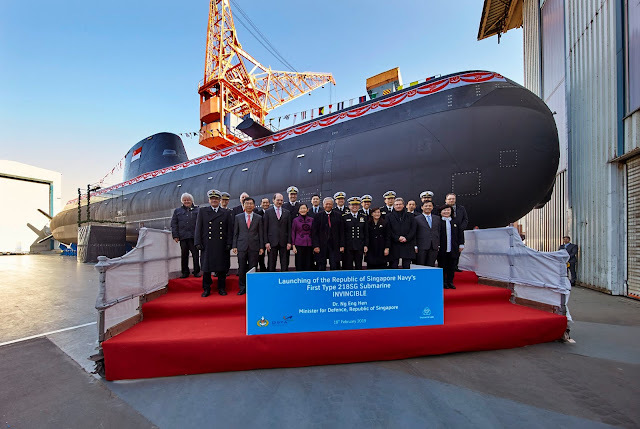 Just as Australia would be locking itself into a strategic alliance with Japan if it bought Japanese subs, so would Singapore be if it bought P1s- if Singapore's interests are not aligned with Japan's, can the programme continue. Such programmes typically take years to complete, and times now are pretty volatile. The upside is Singapore has more or less been sitting on the fence with regard to the South China Sea disputes, going as far as to say only that international law must be respected; Australia, on the other hand, has taken a more overt stand. The decision to buy will thus likely incur political consequences as such purchases would be seen by China to: 1. Aid in Japan's reinterpretation of Article 9, and; 2. Aligning with Japan. Buying elsewhere (eg. Europe, Israel) or from an existing supplier (eg. US) would thus offer more strategic flexibility. By the way, your efforts in your blog are highly commendable; excellent work, and please keep up the research! absolutely spot on. However, in these volatile and uncertain times, even the US is turning unpredictable and it would behoove ASEAN neighbors to rally to one another's aid if China insists on its coercive imperialistic bent. It is very unfortunate to see that no one will be making any alliance with Japan and her superior offerings. You hit the nail right on the head. Singapore as well as many ASEAN nations with the exception of the two most affected by China's land grabbing antics in the South China Sea, namely the Philippines and Vietnam, have been slow to criticize China probably for fear of affecting bilateral trade relations. They have become way too dependent on China economically for their own good. Thank you for reading and commenting.